I haven’t picked too ambitious a title there, have I? Let’s see how we do! In this first part, we’re going to talk about how the timing works and what implications that has for studying and taking the test. In the second part, we’ll discuss practical strategies for time management training. Time management is obviously an essential GRE skill, and one of the (many!) skills we need for this test is the ability to maintain an appropriate time position. Time position refers to the relationship between the number of questions that have been answered and the time we’ve taken to answer them. Thinking of taking one of our 9-session GRE classes? Here’s one benefit of our classes that we don’t mention anywhere else on our website, and that sometimes takes our students by surprise—when we give you a list of 49 words to learn every week (that’s 7 per day), we also follow up with a vocabulary email using those 7 words in context. Here’s an example of the vocabulary emails our course students receive every day. Not long ago I was working as a private eye when a SLIGHT young man came in asking for my help. He was so emaciated, enervated, and lacking in VIGOR, in fact, that it looked as though he hadn’t eaten for a week, although he had just enough energy to twitch nervously. He began his story. He had been working as a busboy, clearing dishes from a table of pugnacious-looking women when one of the women shrieked and began grabbing at his apron. He scuttled back into the kitchen, only to find the women at his apartment door the next morning. He ran. He had been running ever since. It was a verisimilar tale. Just then, a terrible FRACAS erupted on the street below my office. That was always happening back in my private eye days “ just as I’d sit down with the paper and a nice cigar, some petty criminal would run off with an old lady’s purse or a bunch of bananas and cause a din down below that scotched my equanimity. Anyway, this young man looked terrified. They’ve found me! he cried, attempting to hide in my coat closet. Everyone at a party is either a man or a woman. After 8 women leave, there are four times as many men as women. After 35 men leave (and the 8 women do not return), there are twice as many women as men. Sentence Equivalence: Try This Problem Now! The perimeter of an equilateral triangle is 1.25 times the circumference of a circle. Win A Free iPad and Complete Set of 8 MGRE eBooks! Did you know that our acclaimed GRE Strategy Guides are also available in the eBook format? You can now enjoy the full weight of the knowledge contained within our strategy guides without having to lug around the full weight of the books! It’s win-win! To celebrate digital GRE prep, we’re giving away a complete set of our 8 Manhattan GRE Strategy Guides in the eBook format and, so you have something to read them with, we’re also giving away a brand new iPad along with them! To enter to win, all you need to do is go to our Facebook page and “Like” our status about this giveaway. We’ll pick a winner at random from the list of people who “liked” that staus on May 15th at noon, EST. Flashcard Sneak Peek: It’s a Face! It’s a Verb! 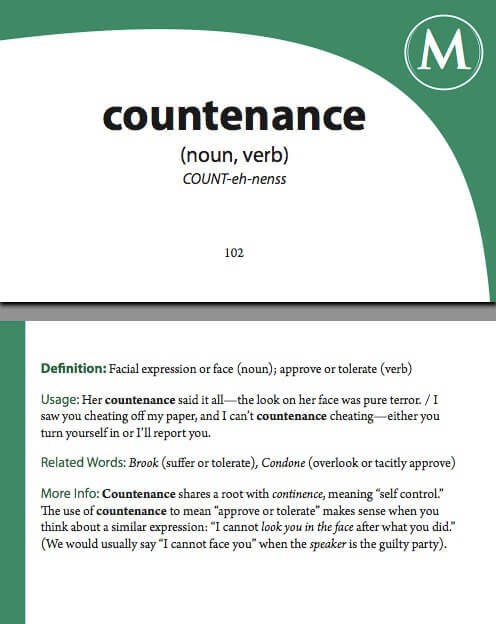 It’s “Countenance”! Take a sneak peek into Manhattan Prep’s 500 Essential Words and 500 Advanced Words GRE flashcard sets. When I make an error, I get excited. Seriously—you should be excited when you make errors, too. I know that I’m about to learn something and get better, and that’s definitely worth getting excited!